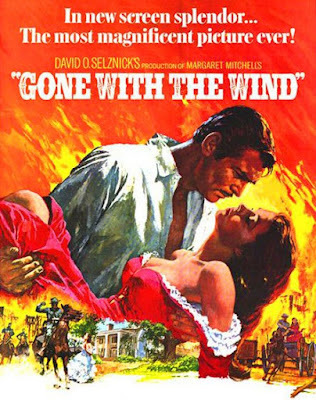 The first time I saw a Gone With The Wind book, was when I was first year high school. It was being read by my bookworm elder sister. Admittedly I was not attracted to either its title nor its cover. Having no idea of the American Civil War and only being familiar with artwork reminiscent of the Louis L'Amour western novels my grandfather read extensively (and repeatedly), I assumed it was some sort of John Wayne type or a cowboy novel. So I really didn't even consider graduating from my regular Hardy Boys and Nancy Drew novels to a 1040 page novel (or 900 plus, depending on the printing). My only knowledge then of GWTW was its song: Tara's Theme which my mother would always request me to play on the piano. Back then, only 13 years old, I was brought up in an environment with a strong consciousness of ones' actions and words. Being guided by a school run by strict La Sallian brothers and faculty, molded me into a person whose thoughts and actions where ruled by the goal of being the perfect Christian gentleman. So how did I come across this book? The exact moment is unknown to me. I just know it came out of boredom from the long Summer, and a need for all of us in the family to be holding a book in hand -- hoping we could be literature literate and to keep us out from playing out in the streets too much. I was immediately drawn by the twists in the plot of the novel. The twist in the lead characters: Scarlett O' Hara who was probably the most honest character I've ever encountered in literature and in life at that time. Rhett Butler who bared the truth of the war, not wanting to be hero of it, but wanted to make war his hero in furthering his interests. The unrequited love, the foolish pursuit of an imagined love, and the strong will to survive come hell and high waters (come hell of Atlanta burning actually). GWTW seemed to be teaching life values unfamiliar to my rearing. I felt it wasnt' wrong to speak your mind, nor was it wrong to be practical. Of course Scarlett O' Hara and Rhett Butler went overboard. It was romance with a lot of honesty and yet lacking in a common truth: that they actually did love each other truly. Since then, the book has found its place by my bedside ready for a re-read or a peek again at how it is to love it again. I have actually gathered some memorabilia of GWTW: books, posters, script, dolls and drawings. Even up to now, I wouldn't mind re-reading it again. It's an affair that never ends. Read it and discover the magic of what it feels to go with the wind of Margaret Mitchell. What an interesting story... Actually I share this passion with you, of course... I read the book when I was 15... It was a long hot summer too, and I was looking for something to read, and my mother advised me to read this one. It was a pocket edition of 3 parts, but when I began to read I thought they were only 2 ! It was the beginning of a great passion for the world of GWTW. Immediately after that, I started to gather things about the movie... Photos, soundtrack records... And I made drawings of the characters and of some crucial scenes... From my own imagination, because I had very few images of the movie at that time, and I did not know Vivien Leigh, except for the classic Scarlett photo which was on the cover of the first of my books. I had to wait a few years, and a general release of the movie in Paris, to finally discover this gorgeous piece of cinema ! I think the movie brought out one thing I never had Eric -- gumption. Of course in moderation versus Scarlett -- but I did admire her survival mode. It was the most interesting, un-drop-pable read I ever had.